Are you looking for something really fun and exciting to make for your kids? 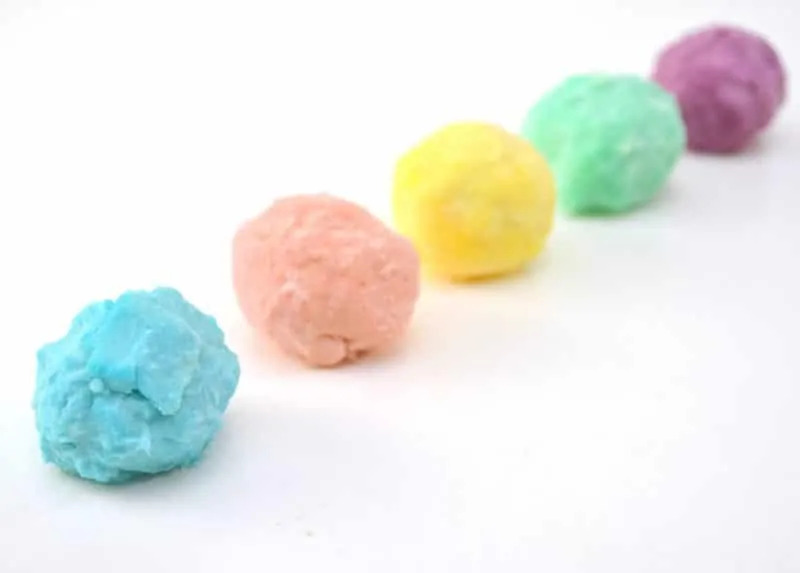 These Magic Rainbow Rocks with a hidden treasure inside will be a huge hit with your little ones. 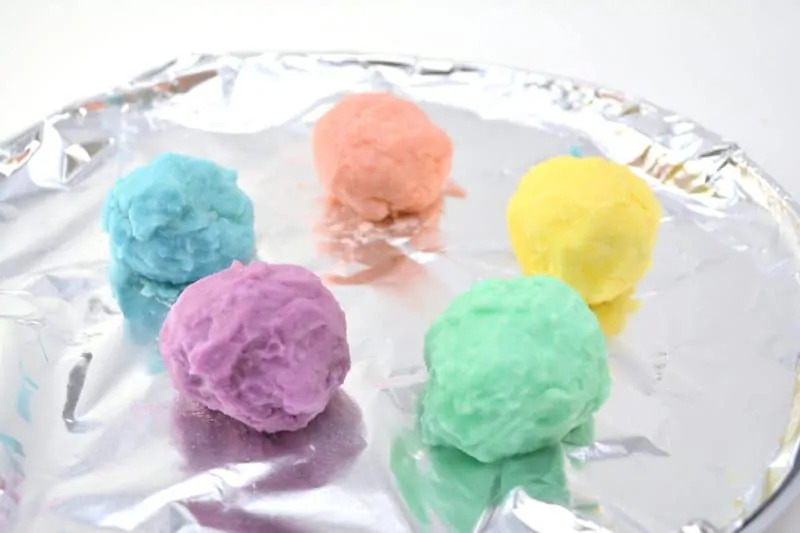 You could even make these with your older kids and then let your younger kids find out what the magic surprise is inside. 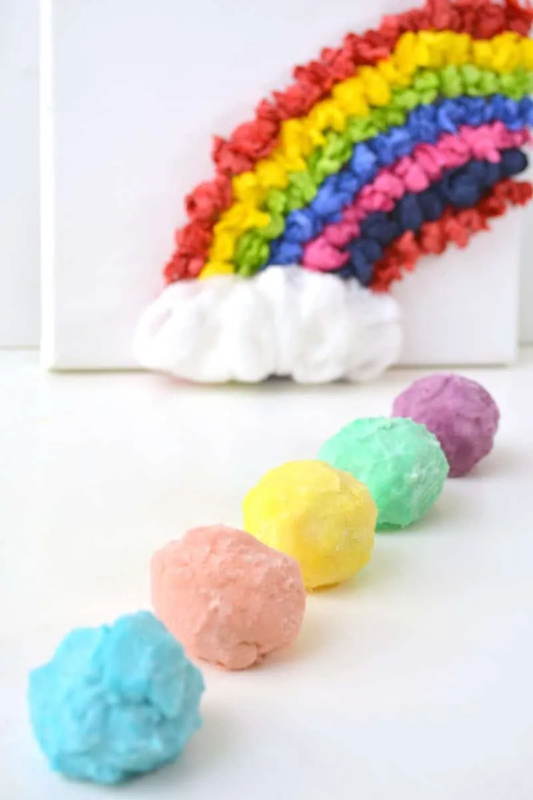 You can make these magic stones in whatever colors you want, but we thought that making them in the colors of the rainbow would make them a fun little St. Patrick’s Day kids activity. You can tell your kids that these are special magical rocks left by the leprechauns! 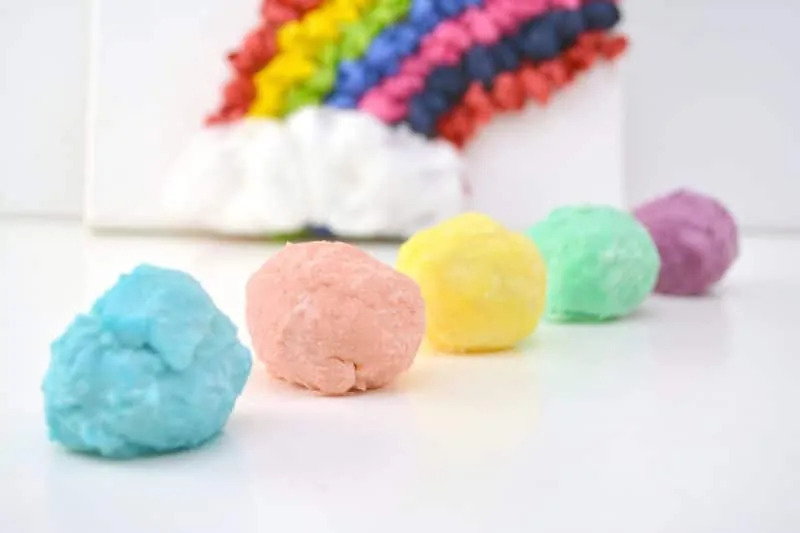 Not only are magic rainbow rocks something fun to make, but it is so much fun to watch the little ones as they discover the hidden treasure buried inside. Of course, the surprise inside is only half the fun. 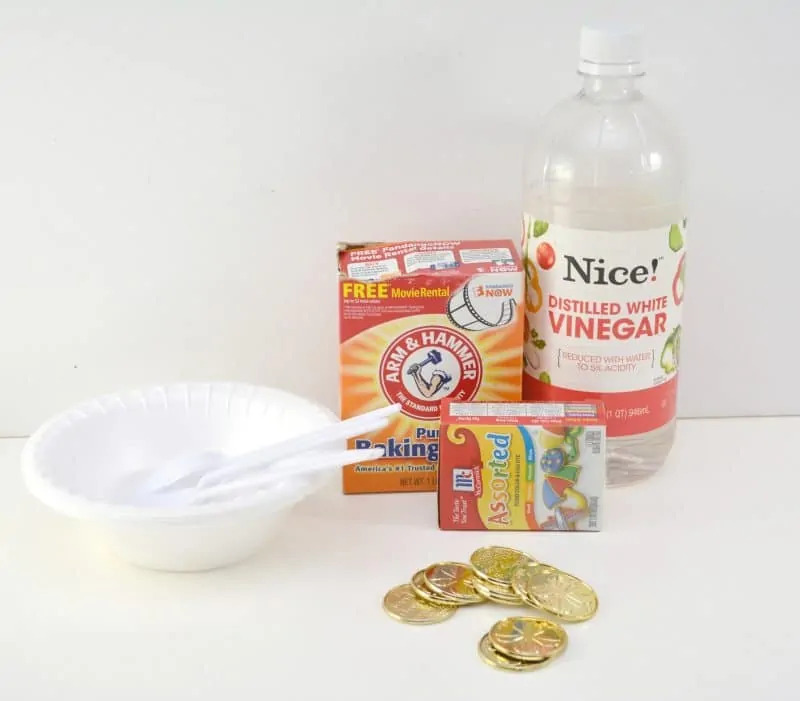 Watching the reaction of the baking soda and vinegar will really WOW the kids, and you can even turn it into a mini science experiment. 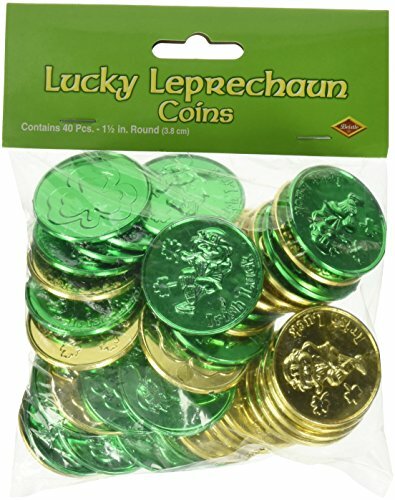 Gold coins are a great surprise to place inside you magic rocks for St. Patrick’s Day. You can find gold coins at your local Dollar Tree. But, you really could put anything small and plastic inside, such as a small action figure or toy. If your kids really love these, you could make them over and over again with different hidden treasures inside. 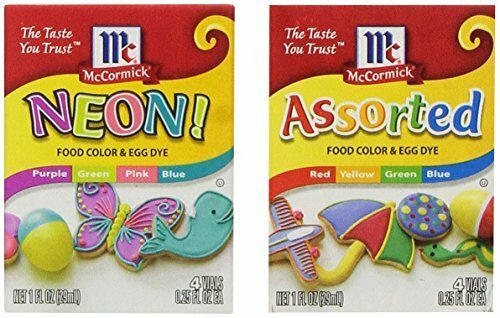 Just get creative and have fun with these. Teachers, just think how much fun with these be in the classroom! Gather several bowls. 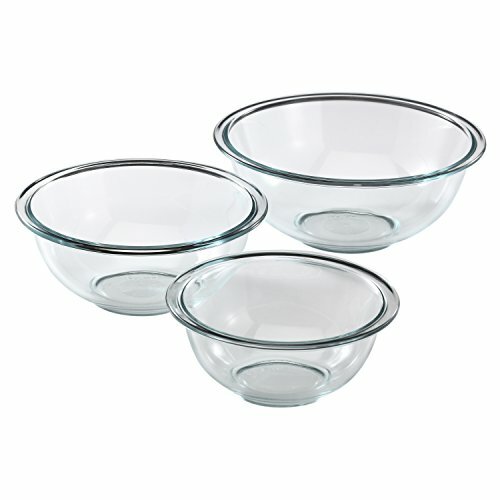 We used disposable bowls, but you can use non-disposable if you wish. 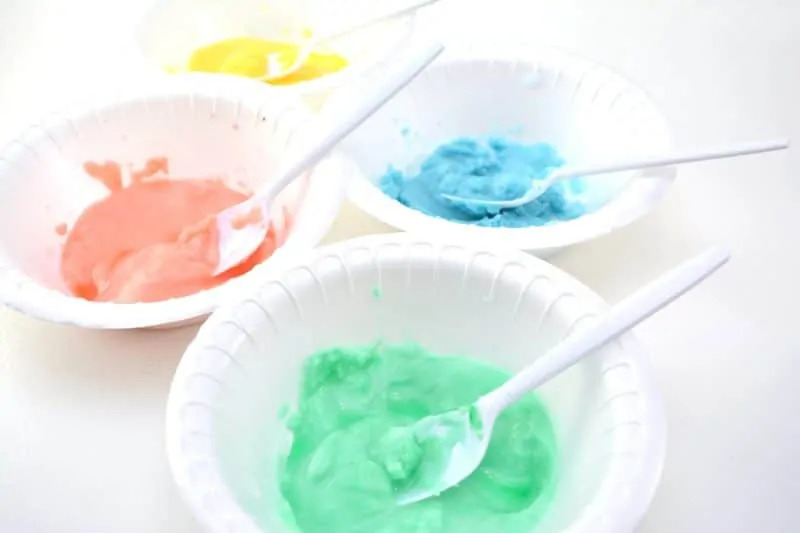 Using a plastic spoon, put 5 spoonfuls of baking soda into each bowl, one for each color you would like to make. 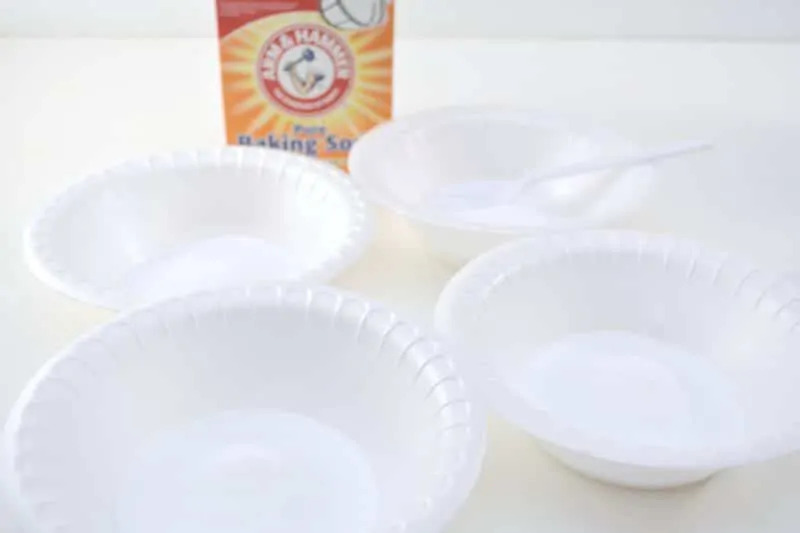 Using the same plastic spoon, add 4-5 spoonfuls of water into each bowl with the baking soda. 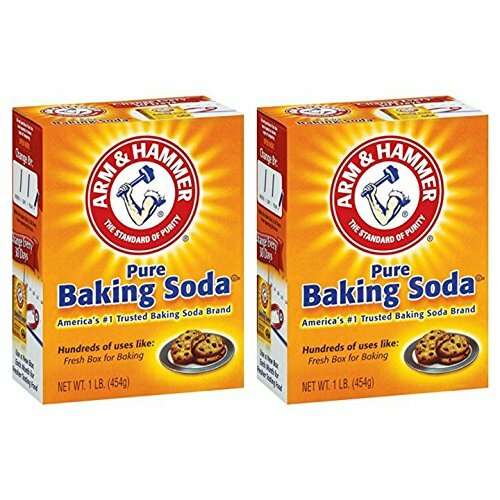 Mix the baking soda and water mixture well. 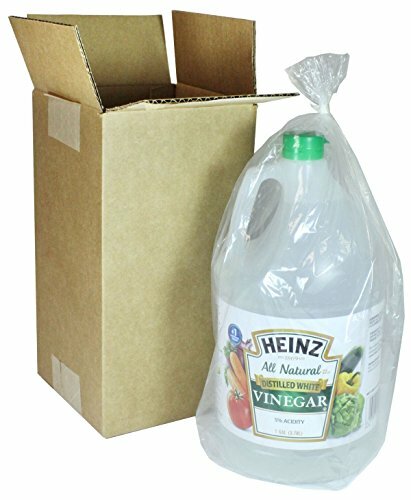 You do not want the baking soda mixture to be runny. It needs to be on the drier side, but still wet enough to mold into a shape. 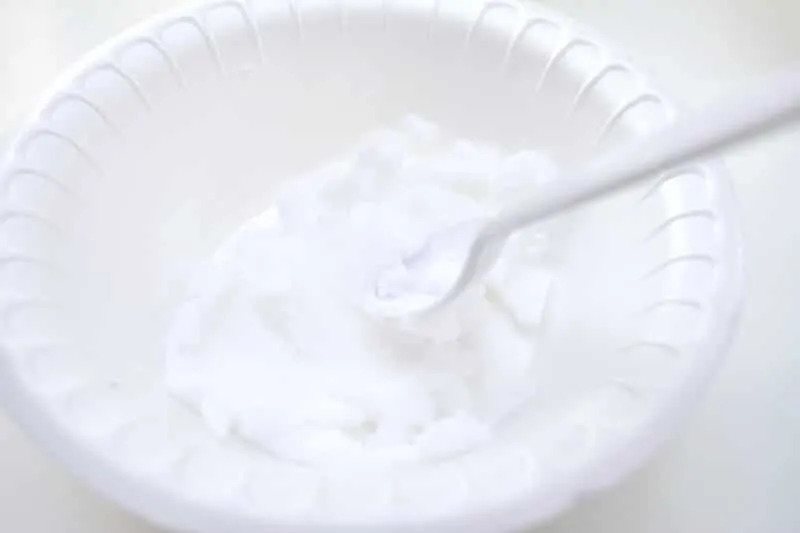 Add one drop of food coloring to each bowl to create different colors of baking soda mixture. Mix well to distribute the coloring evenly in the mixture. 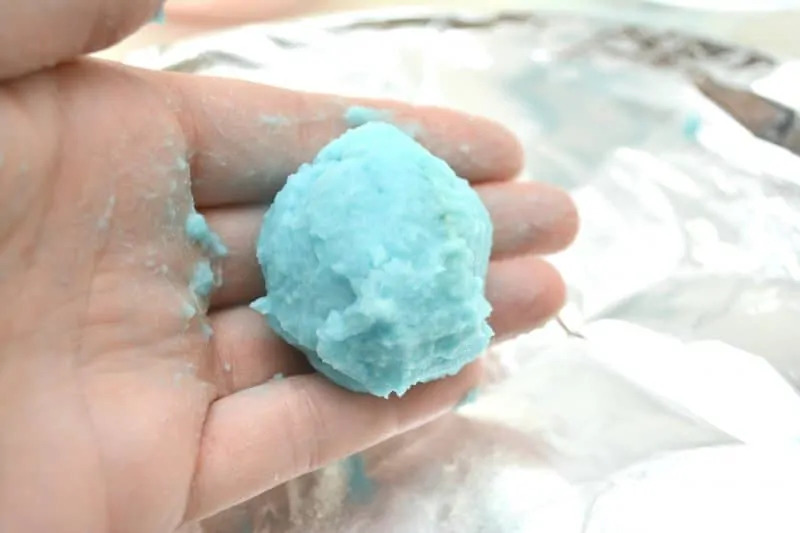 If any of the mixtures in the bowls are too wet, simply sprinkle in some additional baking soda a little at a time until it forms soft crumbles that can be molded into shape. 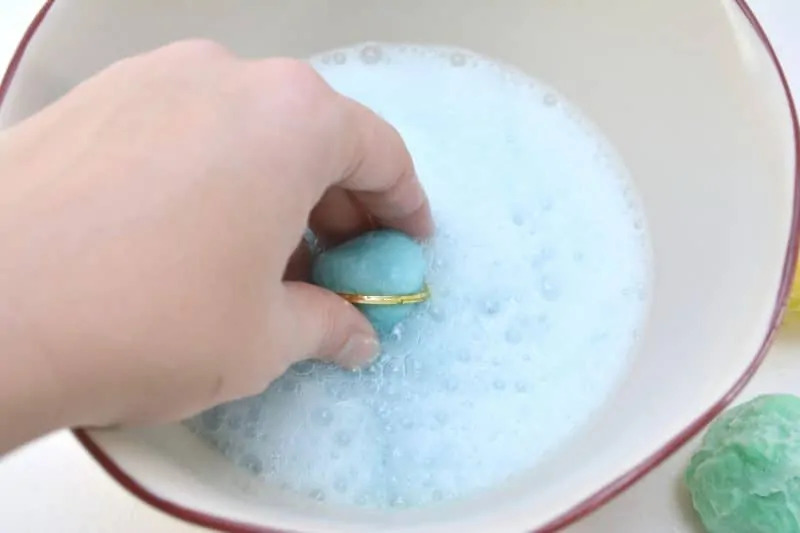 Place a little of one color of baking soda mixture in your hand and form a small flat pancake. 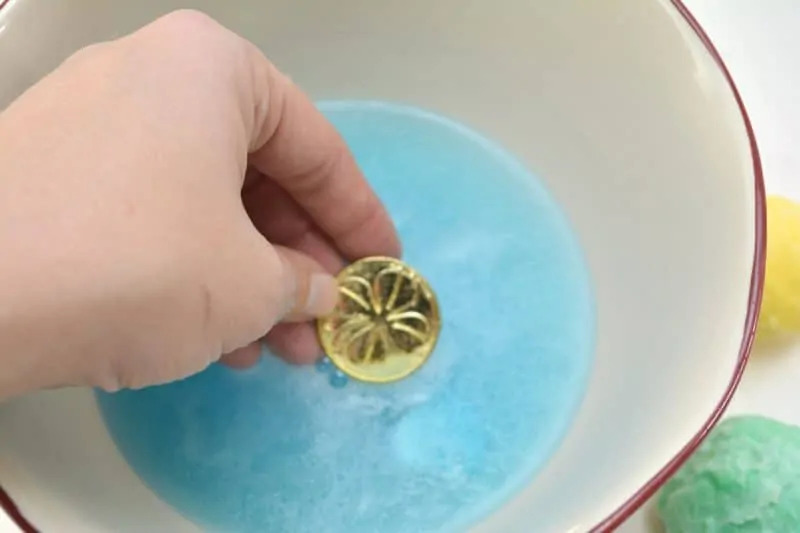 Top it with a plastic gold coin, and then use another bit of the same color of baking soda mixture to cover the coin up, and form the mixture in your hand into a ball that is surrounding the gold coin. Repeat step 6 until you have magic rainbow rocks in each color you wish to make. Place the rocks on a tin foil lined plate and place them into the freezer for at least 1 hour, and up to overnight. 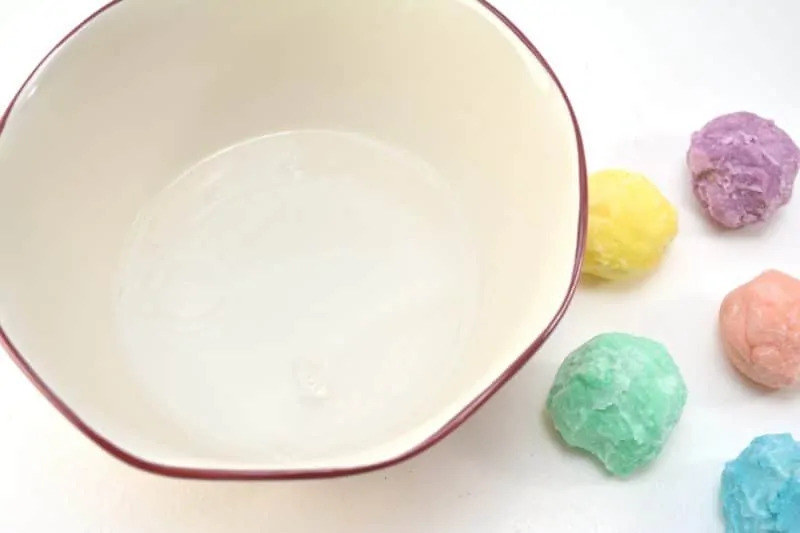 When you are ready to use them, remove the magic rainbow rocks from the freezer, and let little ones drop them into a bowl filled with vinegar. They will get to see a magical reaction and then a gold coin surprise will appear! Very neat! My girls would love to make something like this together. I love this idea! I want to do it for my students for St. Patrick’s day. Thank you for the awesome idea and the easy to follow instructions. What an awesome idea. I will be sharing this with my daughters in laws to make for the grandsons. And I will be making a few for visits here.